Muffin loves to play in the kitchen, when I can I try and invite her in to "do something". Usually she gets bored fairly quickly but she still has fun. On July 4th, I woke up early to bake a couple of pies to bring to a party, and I knew I'd have some leftover dough, so I asked her if she'd like to make her own "little" pie with it. Rather than opting for blueberries, she said she'd like to make a Raspberry pie. We took out her bake set that she got for Xmas, and she "rolled" her dough and "mixed" her raspberries. 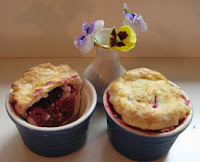 But rather than baking her pie in the kiddie sized pans, she wanted them in ramekins. And they tasted so yummy I think we need to do a big sized one next year for Raspberry season. They came out quite cute, don't you think?